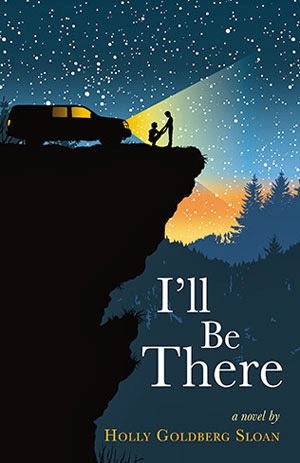 I'll Be There focuses on three people: Emily Bell, a genuinely kind girl from a good home; Sam Border, a talented young man who has spent his life on the run because of his crazy father; and Riddle Border, Sam's younger brother who seems to live in his own little world. Their lives cross paths when Emily's father forces her to sing a solo at church and Sam hears her. Their connection is immediate and inexplicable and Sam knows he should stay away because of his unstable life. But neither can stop thinking about the other and when they bump into each other again, they quickly form a bond and later relationship. Then Emily's parents, who are old-fashioned, insist on meeting the brothers and end up welcoming them into their home when they sense something special in each of the boys. But.. if only it was as simple as that. The storytelling style the author employs here was pretty amazing. Even though Emily, Sam and Riddle are the focus, we get to see the point-of-views of so many different characters. Sam and Riddle's father, Emily's parents, a boy from school who has feelings for Emily (he is so creepy! ), the random people they encounter. At first, it felt like a lot but I quickly understood, appreciated and loved what the author was trying to do here. She was trying to show us how there's a ripple effect to every action. That chance meetings mean something. The kindness of strangers. The darkness that exists in people that we may not be aware of. It's not always an easy message but ultimately it is a beautiful one and one that resonated with me long after I reached the final page. I honestly wish I could tell you more but this is one of those cases where revealing even a little more would take away from the overall effect of the book. Just trust me when I say that these characters are memorable. You will experience a range of emotions for everyone involved from joy to anger and you will root for Emily, Sam and Riddle to find the happiness they deserve. Just be prepared for the many, many perspectives. I wasn't expecting it but it worked for me. I do! It was a bit of slow burn at first but once I was in the story, I was really moved by the book. I'm really curious about this book! I really love the cover, first of all. But the story sounds incredible, too, particularly because it has such an interesting idea to it. I may just have to give this one a read! I'm so happy you enjoyed this book! I really loved it too! I would definitely agree with the slow burn but after a while, you really do get very invested into the story! I wasn't expecting the multiple perspectives to work either but Holly pulled it off.